In less time than I thought, Alfric is all painted and ready for action! This model painted up fairly quickly, although I did spend the majority of my Saturday working on him. This project was a lot of fun. As I mentioned in my WIP Alfric post, he is comprised of Inquisitor Coteaz, Njal Stormcaller, some Grey Hunter bits, and green stuff. Games Workshop isn't always the best at keeping their minis to their own scale, so even though Coteaz is a wimpy human, when standing next to a Space Marine, you actually can't tell the difference. I especially enjoyed working on his cloak. It took me longer to do than anything else on him. I'm still rubbish at painting brown fur, though. I really don't know what it is about brown fur, my grey fur turns out fine. I have a good technique down for the wolf tail talismans, but somehow it doesn't translate over to pelts very well. Someday I'll figure it out. 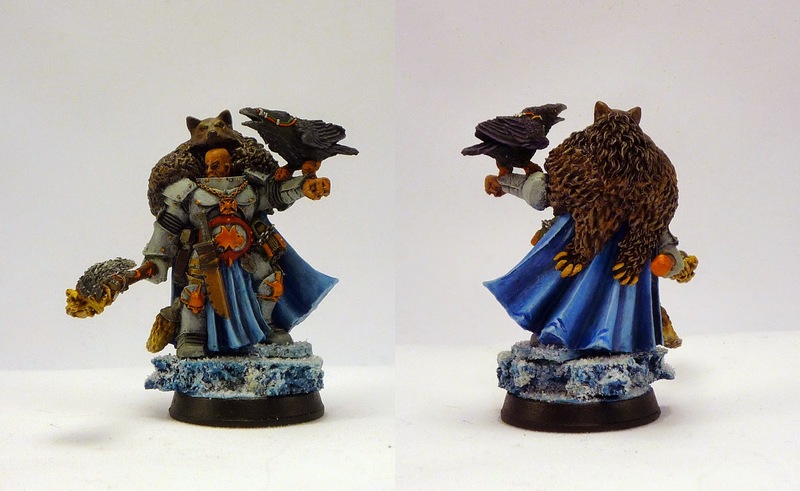 He has his cool cyber raven, but sadly, when the new Space Wolf codex came out, it dashed all my Chooser of the Slain ideas (as that is no more) so I didn't bother with finishing his Chooser marker. So now he has a raven friend just for fun. He'll see his first real action this coming weekend at a local tournament. Then it's basically time for the NOVA Open. I'm really glad I can test out my new 7th edition list in a tournament setting before the big event. I won't be able to get too many games in with it, but a few is better than none. Hopefully the first list I made works out, because I really only have time to test one sufficiently. My last, but very much not least, project remaining for NOVA is my Imperial Knight. I just have to finish one arm and he's all set. I even started getting his fancy base together over the weekend. I have this week off from school (yay, summer vacation) so if all goes well he'll be fully finished in time for Sunday's event. 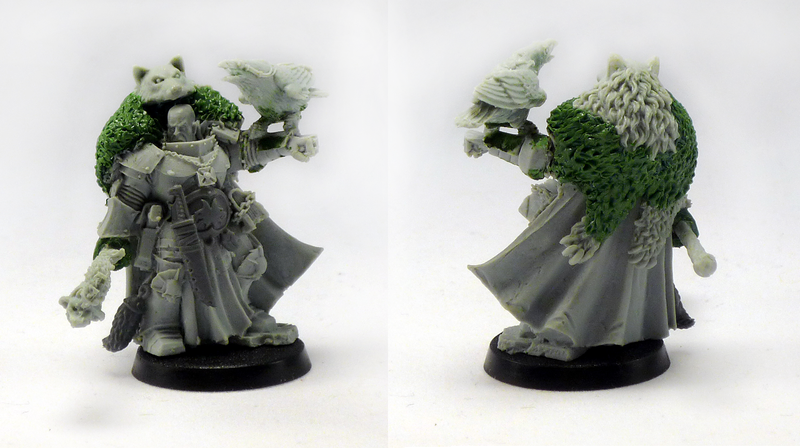 Interesting take on the inquisitor Coteaz model. I like all the kit bashing and greenstuff work you did on him. Very fitting for a rune priest! I think the scenic base work also helps him standard at similar height (or larger) to a standard marine. Nice work overall! He looks awesome. Great work! That looks awesome. Can't wait to see your knight ! Very nice work. If I didn't know better, I'd say the kit was meant to look that way. Thanks! He's based the same as the rest of my Space Wolf army. Because GW doesn't always scale right, he's actually almost exactly the same size as a regular Space Marine. I checked that before I started, just to be sure. Thank you! Hopefully I'll have photos of the Knight up next week. If it wasn't for Coteaz's army holding up his eagle, it wouldn't have work as well, or as easily. I don't think I could have sculpted him a whole new arm. The hand for the staff was hard enough. 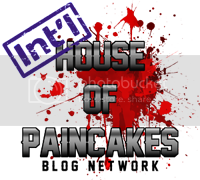 Take a look at Games Workshops YouTube painting tutorials with thunder wolf. Duncan Rhides paints a brown furred wolf.